Do your kids bring home a boatload of art from school? Are they prolific painters on the weekends too? More importantly do they act like it is a sacrilege if you don’t keep every scrap of paper they have ever put a crayon to? If any of these things sound familiar to you – keep reading. I’ll show you my families solution that preserves their art, keeps my creative juices flowing and gives the entire family something to look back on. 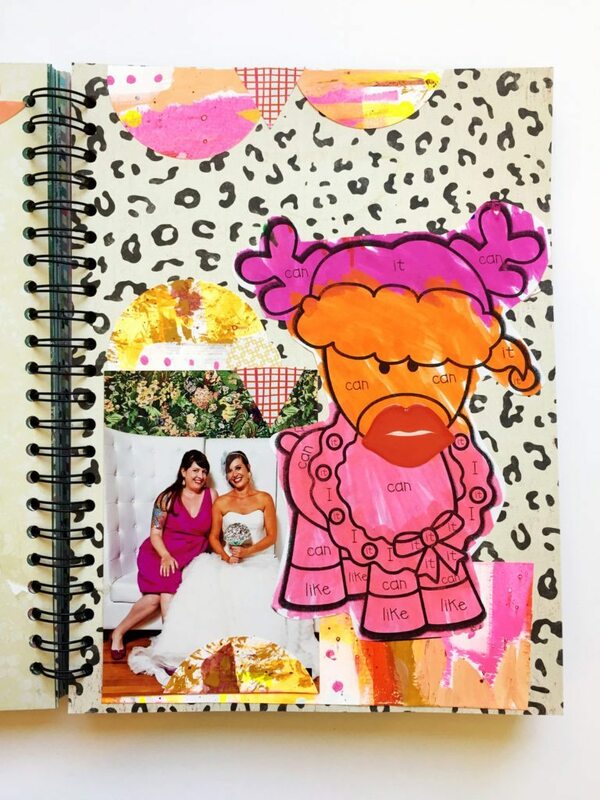 Full disclosure: I already have a thing for art journaling, smash booking, scrapbooking and junk journals. I’ve found that glue sticks and messy paint are my version of meditation and yoga. I also lean to the mixed media side of things when it comes to my art (check out Jennifer Perkins Art for proof). All that being said this method of memory keeping involving your child’s artistic endeavors was a natural progression for me. They are always creating next to me. If mommy is playing with clay, so are my kids. If I’m painting I know to get out two brushes. 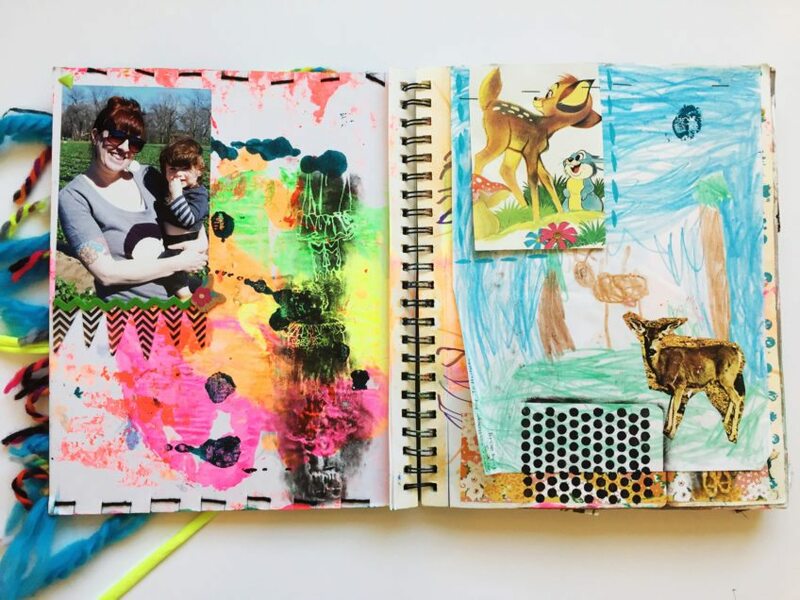 Why shouldn’t my art journals be the same way? Sometimes I just hand my kids the journal and let them put paint to paper. Other times the kids have brought me art they made and I add it in later as an extra layer in the journal. 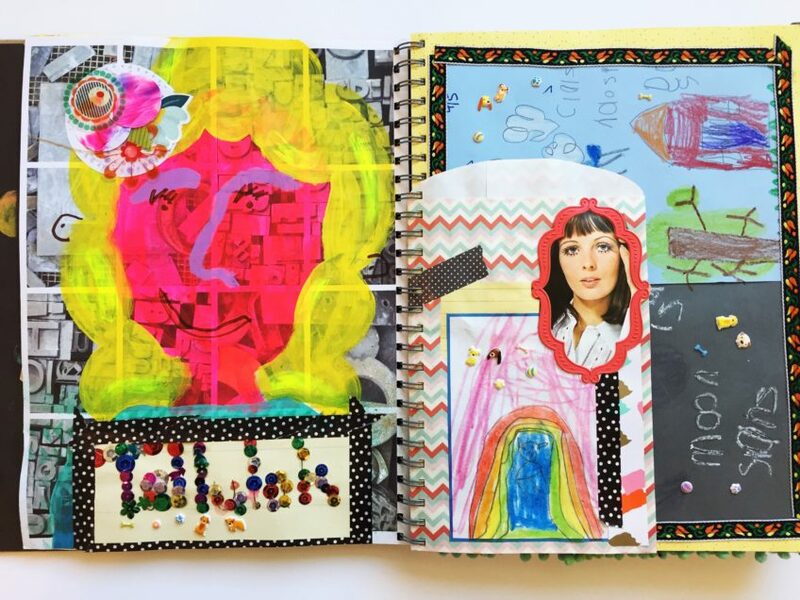 How you incorporate the art into the journals is a matter of preference. This crayon drawing of deer is stapled right into the journal. You can also see that I had no qualms about stenciling right on top. 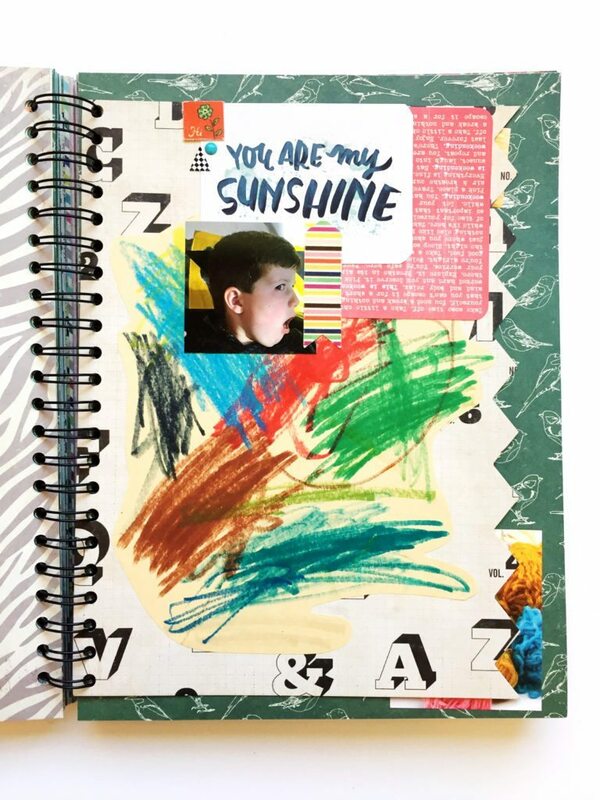 The kid art is just another layer in the mixed media journaling process. 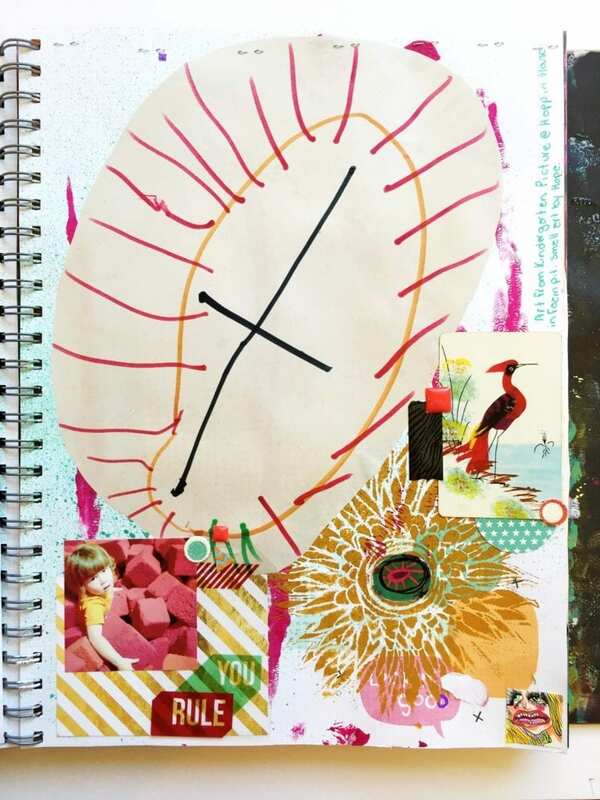 There is no hard and fast rule that says you can’t add art into a scrapbook (or Project Life) and the same thing is true for adding photographs into an art journal. Can you tell I’m not one for rules when it comes to creativity? 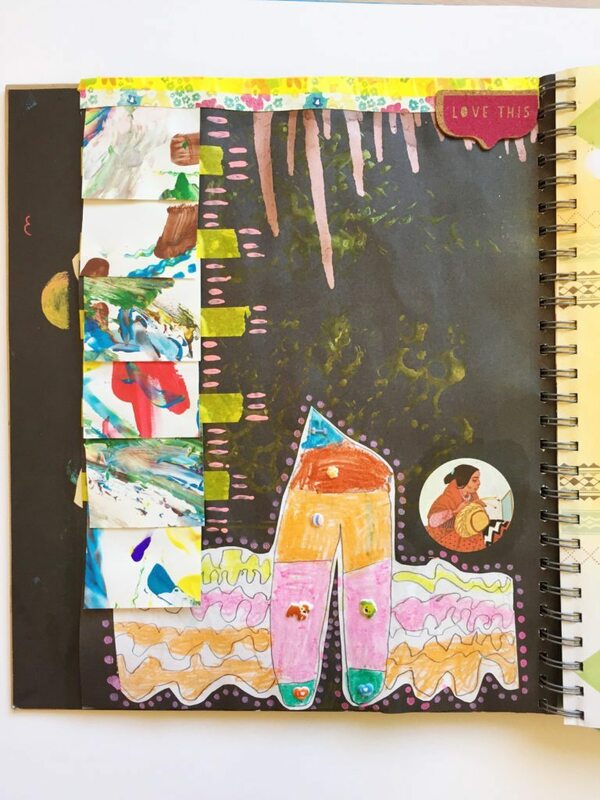 This particular page is a combination of a little bit of everything: kid art, stickers, photographs, Project Life and more. The whole page layout does not have to be BOOM kid’s art. Sometimes I cut out their pictures and use the images just like any other piece of ephemera or scrapbook embellishment. Maybe I’ll start selling their art in my Collage Curio packs. If your kids are still in the scribbling phase or painting more large scale ‘abstracts’ use a punch to make embellishments. I make polkadots from my kids artwork all the time to incorporate into these books. Another rule I like to break is for pages to be coordinated by colors, not theme. I find themes stifling. Just because this picture is from my sister’s wedding does not mean I can’t put it next to a reindeer my kindergartner brought home. No, you can’t keep every piece of art your children ever make. Especially if they are as prolific as mine. 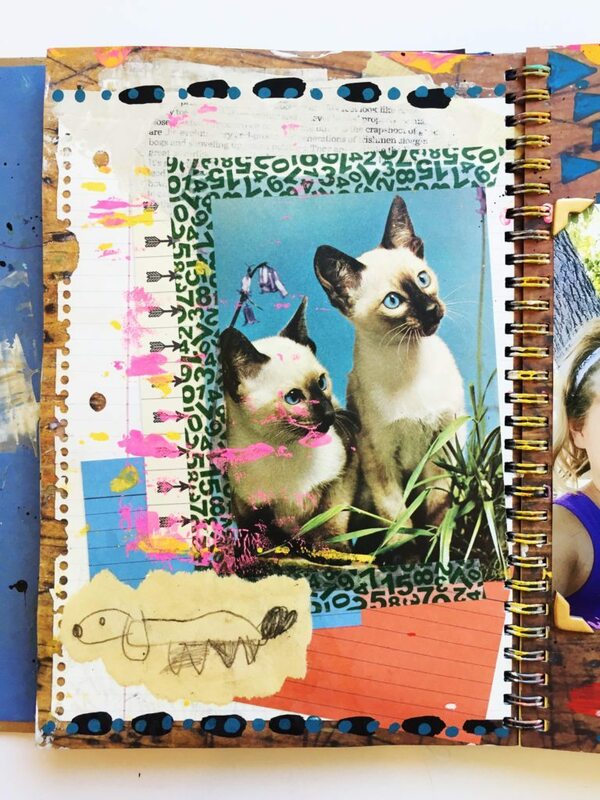 However, there are clever ways to display and incorporate these pieces into the art journals and scrapbooks you may already be keeping. 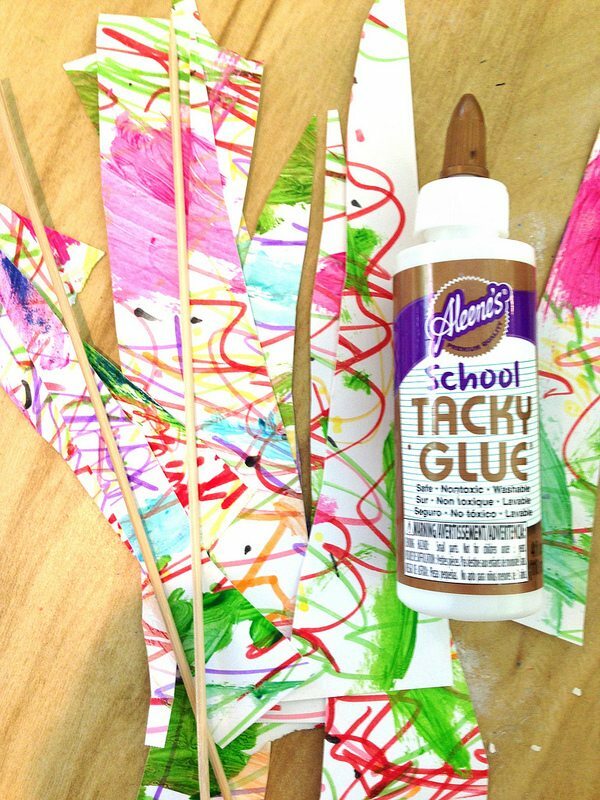 Pass the kids some scissors and glue sticks and together you will be surprised what you can create. 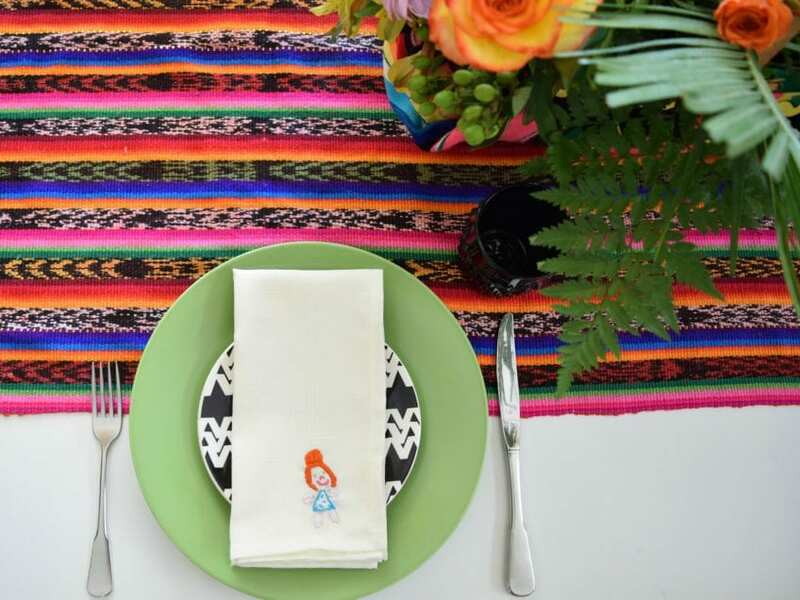 Set the perfect family table with napkins embroidered with custom family portraits. Ask your child to draw each family member and then check out my how-to on DIY Network about embroidering them onto napkins. Another fun option for younger kids still scribbling or even older kids learning about abstract mark making paper beads are a great project. Cut, roll and glue – presto Wearable Kids Art. Let me know what you do with your kids art. I can’t scrapbook, wear and embroider all of it so I’m always open to suggestions. Posted March 3, 2017 & filed under Crafts, Kids Crafts, Paper Crafts.